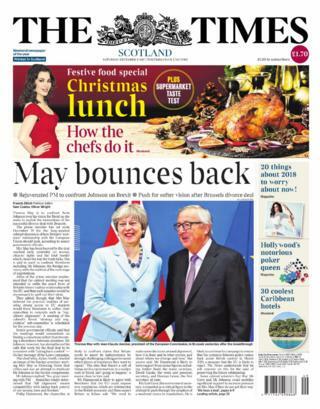 The front pages are dominated by the long-awaited Brexit "breakthrough" deal between Britain and the EU. Prime Minister Theresa May and Jean-Claude Junker shook hands in Brussels after an intensive week of talks. 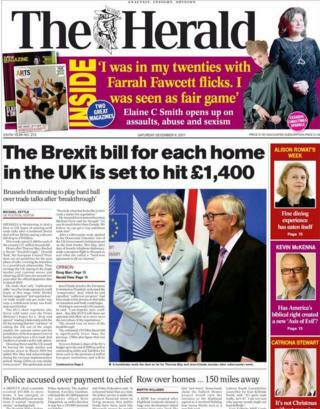 The Herald reports the Brexit bill for each home in the UK will be £1,400 - the cost of dividing the £39bn divorce bill by the UK's 27 million households. 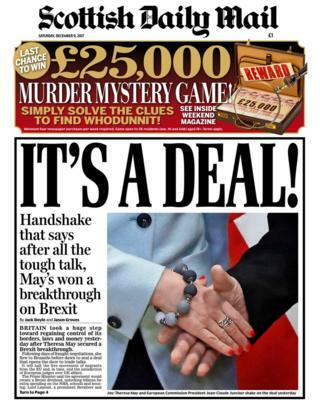 The Scottish Daily Mail features a close up of the handshake and highlighted the prime minister's claims that the agreement will unlock "billions" for extra spending on the NHS, schools and housing. Ms May has been rejuvenated by the agreement, according to The Times, and will discuss how the "end state" relationship with the EU will look at a special cabinet meeting on 19 December. 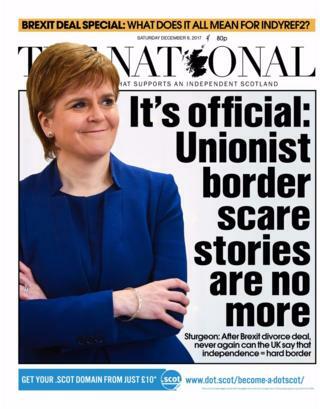 The National reports the deal, which agreed not to impose a hard border between Northern Ireland and the Irish Republic, signals an end to "unionist scare stories" about the consequences of Scottish independence. 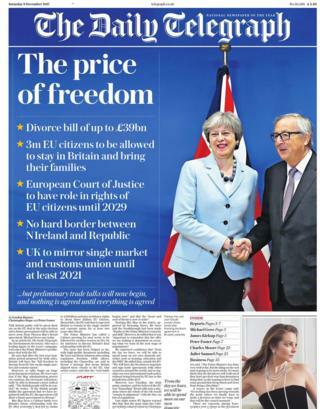 Under the agreement 3m EU citizens will be allowed to stay in Britain and bring their families, The Daily Telegraph reports. 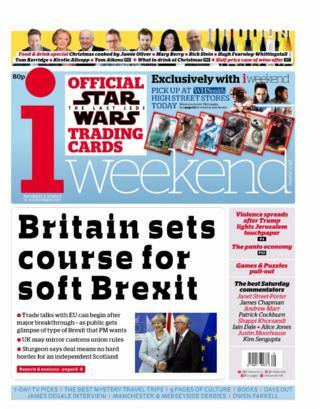 The i states the deal gives the public an insight into the type of Brexit the prime minister wants. 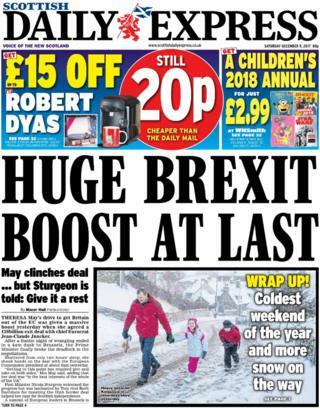 The Daily Express hails the agreement as a "huge boost" and said a "frantic night of wrangling ended in a 4am dash to Brussels". 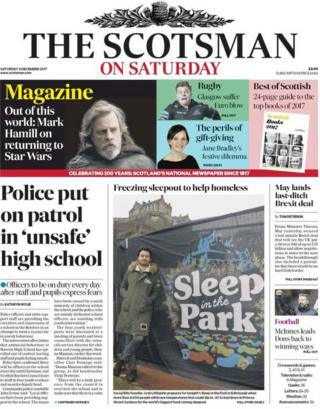 The Scotsman leads with a report that police have ordered extra patrols at a high school in the Borders after staff and pupils claimed they felt unsafe. 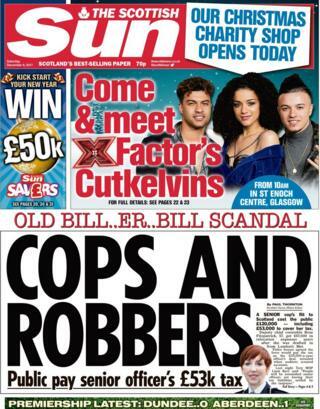 The latest row to hit Police Scotland makes The Sun front page after it emerged Deputy Chief Constable Rose Fitzpatrick move from the Met cost the public £120,000 - including £53,000 to cover her tax. 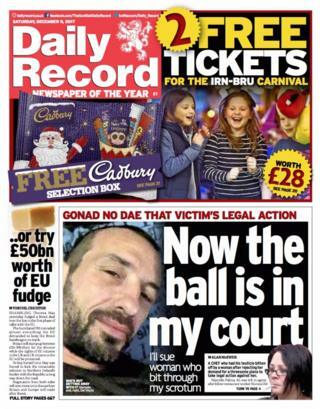 The Press and Journal reports that rough sleepers fear violence, while The Daily Record claims a man who had his testicle bitten into now plans to sue the woman who was convicted of assaulting him. And The Daily Star leads with claims alleged bullying behaviour by ex-footballer Dennis Wise on I'm A Celebrity...Get Me Out of Here! 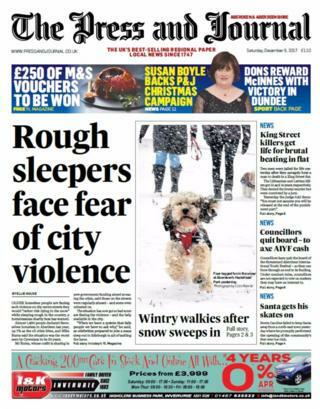 has attracted a "record number of complaints" to watchdogs.